Adrian Lam is hoping to welcome back up to FIVE players for Friday's crunch tie with Huddersfield. Winger Dom Manfredi is in line to play his first game of the season. 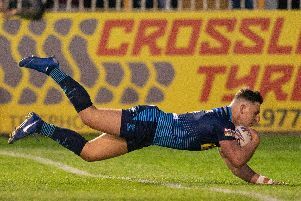 And reinforcements in the pack will give the coach some selection calls to make following Sunday's shock 18-16 loss at newly-promoted London Broncos. Forwards Joe Greenwood and Gabe Hamlin missed the trip to the capital after failing concussion protocol assessments in the week, following head knocks in the previous week's golden-point loss to Hull FC. Ben Flower wasn't risked on London's artificial surface because of a rolled ankle and should shore up the front-row - an area which Lam was pleased with against the Broncos. Winger Liam Marshall is also expected to be available again after missing out through illness. But it is the return of Grand Final hero Manfredi which will excite many supporters. The winger has not played since scoring two tries in last October's title-decider at Old Trafford. He had a minor clear out operation on his knee just before the start of the new season but is now fit and ready to reclaim his wing spot. "We've some troops are starting to come back this week, which is great," said Lam. "I think Dom's arrival will lift the spirits of the players." Dan Sarginson limped off against his former club with a corked thigh. "Hopefully he's okay for this week," added Lam, who has no suspension issues to worry about. Broncos' try-scoring prop Eddie Battye was cautioned for dangerous contact.